Today, I present the second half of the #2-wearing players! I have to say that even though there are plenty of players that do not even come close to rising to the top, there are also a few that had to duke it out in order for me to reach my "All-Time" Uniform Number 2 player. I will post my choice on Thursday, giving time to let you digest the entire field of candidates! I know, I'm a stinker, aren't I? Jose Hernandez - 2 seasons (1992,2005) - Hernandez only wore the #2 in 1992, but like many Tribers, he wore different jersey numbers during his time with the Indians. To be honest, I haven't given much thought to what I am going to do about that for the purposes of this list. Guess we'll see! Regardless, Hernandez managed to play only 2 seasons with the Indians, and at the same time covered a 13-year span. That should probably win him something, but that's a whole different list. In '92, had 4 at-bats in three games, striking out twice. His average? .000. He moved on to the Cubs, Braves, Brewers, Pirates, Rockies, back to the Cubs, then to the Dodgers before coming back to the Indians. He fared better this time around (2005) with 54 hits, 6 homers, and 31 RBI's (avg: .231). Ken Aspromonte - 3 years (1960,61-62) - Aspromonte came to the Tribe in 1960 from the Senators. After playing 117 games, he went to the Angels as part of the expansion draft, and then he came back to the Tribe the next season. He batted .290 in his first year with the Indians (probably why the Angels snapped him up) with 133 hits and 48 RBIs. He batted .223 with the Angels (probably why they optioned him) and came back to bat only .229 and then finish his time as a Triber with a paltry .143. After his playing career, he came back to manage the Indians from 1972-74. 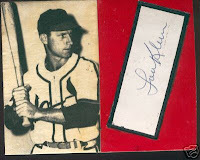 Lou Klein - Part of 1 season (1951) - Klein started out with the Cardinals in 1943 and then in 1946, he and several other MLB players left to play in the Mexican League. Because of this, the players were banned from the MLB for five years. Turns out the ban was lifted in 1949 and Klein returned to the MLB. The Tribe picked him up in '51, where he played in a whopping two games before he was passed on to the Athletics. Guess the Tribe was not too happy with his zero average. Luke Sewell - 13 seasons (1921-1932, 1939) - Sewell entered the major leagues with the Indians, playing in 3 games and amassing a .000 average. Unlike other Indians who had accomplished the same feat, the Tribe stuck with Sewell. Sewell was not a full-timer until 1926, and he came out swinging - 103 hits, 46 RBIs, but no homers, netting him a .238 avg. The next year, he smacked for a .294 avg with 53 RBIs, 138 hits, 27 doubles and six triples. One of his greatest accomplishments came due to his ability to keep strikeouts to a minimum. In fact, he never struck out more than 27 times in any one season, even with 430+ at-bats in several! He was also very dangerous on the base-path. His LOWEST percentage for the Tribe was .333 whenever he tried to steal. In fact, the only .000 stolen base seasons (with the Tribe) were the ones where he did not even ATTEMPT a steal. His overall stolen base average is just under .500 whenever he attempted to steal during his Indians career, and he had several seasons in which he was attempting 10 or more steals per season. He holds the MLB record for playing 20 seasons as an active catcher. Matt Merullo - 1 season (1994) - Matt played in 4 games, batted 10 times, and got one (yes, count it) one hit. He left the Indians with a .100 average. There's just not much more you can add to that. Rafael Santana - 1 season (1990) - Until this project, I don't think I knew that Santana had played for the Indians. He played in 7 games, hit one homer, and ended up with a .231 avg. Well, at least he got to finish his MLB career with guys he played with in his Mets days: Keith Hernandez, Jesse Orosco, and Stan Jefferson. 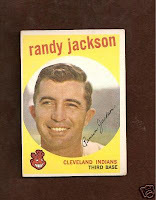 Randy Jackson - parts of 2 seasons (1958-59) - This former Razorback spent time with the Cubs and Dodgers before spending a little time in a Tribe uniform. 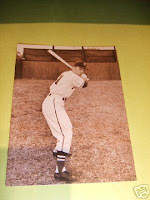 In 1958, he played in 29 games with 22 hits, 3 doubles, a triple, and four homers for an avg of .242. The next year, he went back to the Cubs after only 3 games, where he netted only one hit for a dismal .143 avg. 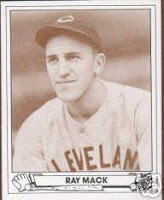 Ray Mack - 8 seasons (1938-1946) - Went from a horrid .152 avg in 1939 to all-star player the next year (.283 average, 12 homers, 5 triples, 21 doubles, and 150 hits). 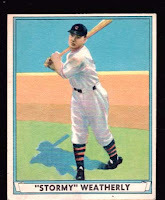 He and Lou Boudreau connected for 109 double plays that year, and he racked up 597 double plays during his career. He is also credited with saving Bob Feller's rear-end at the 1940 opening day no-hitter following a diving catch. After his .283 season, he settled into a roughly .230 average for the rest of his Indians career. Roy Weatherly - 7 seasons (1936-1942) - Weatherly "stormed" onto the scene in 1936 with 117 hits, 28 doubles, 6 triples, and 8 homers for a rookie-year average of .335 in 84 games! He had a couple more .300+ seasons and every season he played (except 1937, his 2nd year no less! ), he batted 250+. In 1940, he knocked 175 hits, 35 doubles, 11 triples, and 12 homers all resulting in a total of 59 RBIs for the season, netting him a 303 average. Sandy Martinez - part of one season (2004) - Martinez played in one game as a Triber, and stood at the plate twice. He struck out once and did not get on base the other time, leaving the Indians with yet another uniform number 2 player with a 000 average. He was sold to the Red Sox in '04 where he happened to be on the Sox World Series team.